A drying and cleaning towel for all those extra parts! 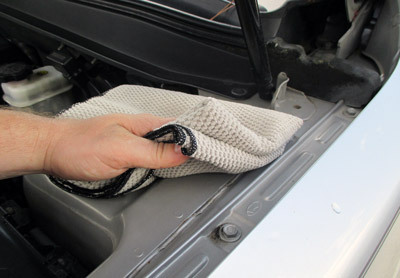 Griot’s Garage Tim’s Dirty Spots Wipe-Down Towels are a blend of drying and cleaning towel. Their specialized design combines a waffle weave pattern with ultra soft microfiber for enhance drying and cleaning ability. Griot’s Garage Tim’s Dirty Spots Wipe-Down Towel is a manageable 18x24 inches, making it the perfect size for a multitude of different jobs. Griot’s Garage Tim’s Dirty Spots Wipe Down Towel has something of a legend behind it. One of those fun stories that makes you want to buy a product just because you like the story. Rumor has it that a customer of theirs fell in love with their waffle weave drying towels, but didn’t like how dirty it got when it was used in less-washed areas such as the door jambs, doorsills, wheels, and trunk and hood channels. He wanted a cleaning towel that would work just as well for drying those areas, but it wasn’t such a big deal if it got dirty. And thus the Griot’s Garage Tim’s Dirty Spots Wipe Down Towel was born. Use Griot's Garage Tim's Dirty Spots Wipe Down Towels for drying and cleaning those often neglected areas. The waffle weave pattern of the Griot’s Garage Tim’s Dirty Spots Wipe-Down Towel grabs and absorbs water, leaving a water spot free finish behind. The soft microfiber gently polishes the paint and leaves a swirl-free finish. Griot’s Garage incorporated rounded, stitched edges to prevent towel-induced scratches and marks. Griot’s Garage Tim’s Dirty Spots Wipe-Down is a cost effective microfiber perfect for when you need a high quality towel finish, without the high quality towel price. Cleans trims and dirty areas from water spot very well.